Laguna Seca World Superbike with the top factory bikes. Valentino at the premier of his new biography with aurhor Max Oxley. Valentino Rossi may only be 23 years old but the Italian superstar already rates as one of the greatest motorcycle racers in history. Young, sublimely talented and dazzlingly charismatic, Rossi seems to have it all. Over a mere six seasons he has swept through Grand Prix racing, winning the 125 World Championship in 1997, the 250 World Championship in '99 and the 500 World Championship last year. This season he has headed Honda's assault on the new-look MotoGP series, riding the spectacular Repsol Honda RC 211V, a 200 horsepower, 5 cylinder, four-stroke bike. This explosive combination has led the three leaders to a new World Championship title, the first of the MotoGP era, with four races left until the end of the season. Son of seventies GP winner Graziano, who won three 250 GPs in 1979, the year of his birth, Rossi has spent pretty much all his life on motorcycles. He rode his first minibike at the age of just two and a half and spent the summers of his earliest years traveling the continent with his father and mother Stefania. Like most successful contemporary sportsmen Rossi found his chosen sport early in life, although he did begin competing on four wheels, racing go-karts. But the costs of getting serious on four wheels were too great for his family, so he soon switched his allegiance to two wheels, contesting his first minibike event in 1990. Commencing the theme of learning the first year and dominating the second, which he continued into 125, 250 and 500 GPs, Rossi was Italian minibike champion the following year. ride Aprilia 125 GP machines in the '95 Italian and European Championships. a serious business but Rossi can work as hard as anyone while apparently treating his job as a bit of a laugh. That perhaps is his secret, for he's always relaxed, always enjoying himself and always very, very fast. Promoted to Aprilia's factory squad he was favorite to win the '97 125 crown. In fact Rossi totally dominated the frantically contested series, winning 11 of 15 rounds. consistency against his more experienced rivals, so once again it was time to look for another challenge. He started his 500 career in the spring of 2000 the same way he'd started his 250 career - fast but flawed. Yet after tumbling out of the first two races he steadied himself and got quicker and quicker. After scoring his first 500 podium in Spain during April, he took his first 500 win in tricky damp conditions in Britain. More podium finishes at the next three races had him challenging Kenny Roberts for the series lead but a tumble at Valencia ended his title hopes. Another win in Brazil consolidated second in the championship. his rivals. Halfway through the 16-round series he had already won five races but a tumble at May's rain-soaked Italian GP and a difficult ride to seventh at July's German GP allowed Max Biaggi to close to within ten points. Rossi responded to his arch-rival's pressure in brilliant style, winning six of the final seven races. He secured the World Championship with two races remaining and his season total of 11 wins gave him the highest percentage win rate of any modern-era 500 racer, just ahead of mentor Mick Doohan, the man who won five 500 crowns in the late nineties. Rossi's cavalier riding style - often likened to that of legendary '93 500 champ Kevin Schwantz - is only eclipsed by his off-track persona, which seems unaffected by his rise to bona fide superstar status. In Italy his fame has reached pop star proportions, forcing him to set up home in London. since kindergarten rather than working the celebrity circuit. He's a keen video games player, motocross rider and rally driver - he has already competed in a number of races with rally cars and may switch to the sport full-time if he ever tires of bikes. This 2002 season Valentino Rossi has joined the Repsol Honda factory team as team mate of the Japanese Tour Ukawa. Despite the change, things have stayed the same with regard to last year, since the reigning World Champion is counting on the same technician and mechanics squad, and is continuing with the colours of Repsol, who already joined him last year during his victorious 2001 season. available points, 7 poles and 120 laps leading during races. These figures reaffirm with no doubt the superiority shown by Valentino Rossi along this 2002 season. On the starting grid with Honda MotoGP team manager Jeremy Burgess. 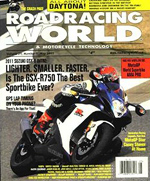 An exciting look at the world's best motorcycle roadracer. Just Click to Order Online!